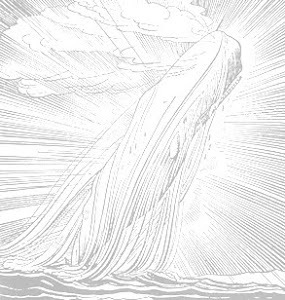 So begins the chapter, "The Advocate", where Ishmael pauses the action in his story, much as Krishna on the fields of Kurukshetra, to lay before us his argument for treating whaling as both reputable and poetic. The argument is twofold: first, we are asked to pay attention to the honor and glory due to the whalesman, and, secondly but more subtly, that going to sea in search of whales has "aesthetically noble associations". Up until now, this book has been a traditional narrative, at least on the surface. On a Saturday in December, Ishmael arrives in New Bedford and has his first night with Queequeg; on Monday, they are off to Nantucket, on Tuesday, Ishmael signs up for the Pequod while Ishmael has his Ramadan. Wednesday, Queequeg makes his mark, and a day or two, perhaps a bit more, passes before notice is given that the ship will sail. Sailing happens on a Christmas - they get to the ship just before six in the morning and are off about noon. There is a story and a pace to it. Once at sea, however, change is afoot. The first thing we have is the six inch tombstone of a chapter titled the "Lee Shore" and the next thing is this multi-page "advocacy." I see Ishamel before the fire, pausing in his telling, pulling the pipe from his mouth, setting it aside, leaning it forward, and with great urgency telling us listeners to forget all that, we're about to get down the real thing, we're going to Sea! But, first, he has something to get off his chest. This chapter and those like it are addressed directly to the reader, and can forcefully pull us right into the discussion. We are asked to have an opinion on myriad strange things. This break in the narrative, coupled with the Lee Shore chapter before it and the postscript chapter after it, tell us this shall not be an ordinary read. While this is not a radical departure in form, as shall come later, it is the inkling of a brewing rebellion. The special role of American whalers will be a special theme, despite, I would note, American whalers most clearly including crew from all the world, the Isolatoes, as this ship does. Likewise, the economics of whaling are emphasized here; we are driven to these pursuits, we are driven to all the happenings on board, however far from commerce they may be, by fundamental economic forces, not just spiritual ones. Drive down your hat in presence of the Czar, and take it off to Queequeg! That great America on the other side of the sphere, Australia, was given to the enlightened world by the whaleman. After its first blunder-born discovery by a Dutchman, all other ships long shunned those shores as pestiferously barbarous; but the whale-ship touched there. The whale-ship is the true mother of that now mighty colony. In addition, you will find the sense of time now becoming vastly more vague. When Peleg and Bildad leave the boat, they take with them the days of the week. Markers will be seasonal at best. For the rest of the book, there will be one or two mentions of the sabbath, a few mentions of the time of day, and several mentions of location, but no other way to pace the actions of the book with real precision. Our pacing will be set by the currents, the skies, and the appearance of whales and of other boats somewhere on the horizon.